by Carolyn E. Wright, Esq. David Segal, a writer for the Style section of The Washington Post, recently posted an article/slide show on Slate that was linked here on T.O.P. asking whether photographers can be plagiarists. Legally, the answer is no. While plagiarizing may lead to a failing grade or a form of humiliation, the legal recourse available to creatives for the theft of their work is found in copyright law. Some may be surprised to find that the purpose of copyright law is not to protect the work of creatives, but, as stated in Article I, section 8, clause 8, of the United States Constitution, "to promote the Progress of Science and useful Arts, by securing for limited times to Authors and Inventors the exclusive Right to their respective Writings and Discoveries." Copyright law attempts to achieve a balance between public interest and the rights of authors/artists so that artists will be encouraged to create and the public will be the ultimate beneficiary. In many ways, the priority leans towards public concerns when there is any conflict in those interests. As a result, the law may not seem fair or just to the copyright owner. A copyright is created at the moment a work is made into a fixed form. For photographers, it is created at the click of the shutter. A photograph is protected by copyright regardless of whether it is recorded digitally or on film. Images on the web are protected by copyrights, just as prints are. Copyright law pro tects both unpublished photos and published photos, regardless of whether they have been registered with the U.S. Copyright Office. · distribute copies of the copyrighted work to the public by sale, rental or lending, and/or to display the image. Copyright law protects the expression of the idea, not the idea itself. If someone takes a photograph of a bridge, it does not prevent another photographer from taking a photo of that same bridge. If, however, the second photo is, in effect, an exact replica of the first without adding any creativity, then the second photographer has violated the first photographer’s right to control copies of the copyright. In short, the second photographer has committed copyright infringement. A copyright holder also has the right to control derivative works. A derivative work is one that is based on one (or more) earlier works (either your own or someone else’s works). It includes editorial revisions, annotations, or other types of modifications. The work must be different enough from the original to be regarded as a new work—it must contain some substantial, not merely trivial, originality. Therefore, if you make a derivative work based on someone else’s work, under copyright law you need permission from the copyright owner, in most cases, or you have infringed the copyright. For example, if you were in beautiful Yosemite National Park on your way to the Mariposa Groves, you might pull into a parking lot next to a tunnel. 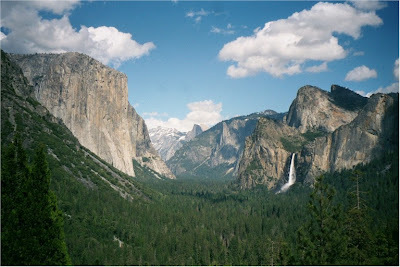 You look to your right and see the splendor of Yosemite Valley including Bridal Veil Falls, Half Dome, and El Capitan. You want to photograph the scene. If you look down closely, you’ll see the thousands of tripod leg indentations. 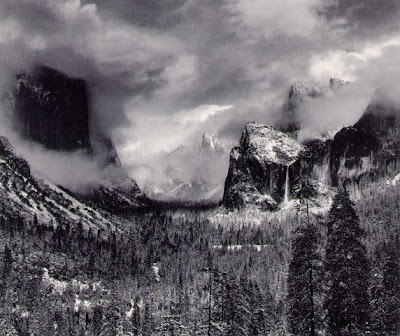 It’s been done before, and done well by none other than Ansel Adams. So when you make an image similar to his "Clearing Winter Storm," have you infringed his copyright? Copyright law protects original expressions, not ideas. So when Mr. Adams had the idea to photograph from Tunnel View, he owned the copyright to the expression of that idea only. That is, his copyright covers the photograph, not the subject matter. So then it’s perfectly OK to photograph the scene at Tunnel View, right? Well, there’s more. Copyright law also protects his expression of the subject including the elements of his composition, the lighting, the shading, the camera angle, the background, and the perspective. The parking lot at Tunnel View is small and allows few options to photographers. If you create an image of the same scene and include some of the same elements of Mr. Adams’ composition, does that constitute infringement? It would only if you produced something "substantially similar" to his work and had access to the original work (which, in this example is fairly easy to show). If you place a copy of Adams's "Clearing Winter Storm" photograph next to your camera and do everything that you can to create precisely the same image, even stating that you are attempting to make an exact copy of his photograph, are you guilty of copyright infringement? It depends on whether an ordinary person would find that you were successful in copying his image to a meaningful degree; but probably not. The trees in the area are different now, the weather and the quality of the light change every moment, and Mr. Adams had skills that most do not have. This is not fair test of direct copying or derivative works because photographs of objects as they occur in nature are not protected by copyright law since they are ever-changing. But studio and other controlled shots have been found to infringe others’ copyrighted works. Unfortunately, it’s a judgment call by a court as to whether a photograph infringes on another work as an unauthorized copy of derivative work. Other considerations such as fair use, transformative use, and public domain enter into the equation as part of the legal system’s effort to promote the development of art. All photographers are inspired by other artists, including photographers. That is how art develops. But when a photograph is so similar to another work that it appears to be the same expression of the idea, it may be difficult to believe that it was an accident. Imitation may be the sincerest form of flattery, but no one is grateful when work is stolen. However, courts don’t always find infringements in those cases despite there appearing to be obvious copying to the outsider’s eye. For instance, artist Jeff Koons was found to have infringed the German shepherd puppies’ picture in Rogers v. Koons but not when Andrea Blanch sued him for a similar appropriation. Law and ethics don’t always take the same path. Does infringement have the same social stigma as plagiarism? It might if photographers continue to educate others about their rights. While photographers may not have the same social sword as authors do to fight plagiarism, at least we sometimes have a mightier legal sword to battle infringements. Carolyn E. Wright, an attorney specializing in the law for photographers, blogs at photoattorney.com. Her book Photographer's Legal Guide is available in softcover or as a downloadable e-book. This was a very informative and interesting article. I have at times paid homage to Mr. Adams’ work by stopping at locations made famous by him. My question is; if copyright laws are meant to protect ‘the original expression not the idea’, how can one copyright an object? The specific example that comes to mind is the famous tree at Point Lobos. If you’ve ever looked at a calendar, it is included in the collection of images (as well as Red Rock Crossing in Sedona). It’s my understanding (and I have been known to be fallible before) that the local community holds the copyright to this vista and charges premiums to photographers having more than a point and shoot. In this case, whose original expression was this? Who was the artist? When does the copyright expire (50 years after the expression or 50 years after somebody had the bright idea to exploit it)? These questions muddy your clear explanation of copyright laws as they apply to photographers. I think you're referring to the Lone Cypress at Pebble Beach, which was rumored to have been trademarked under the golf course's previous ownership. I'm not sure this was ever actually true, although professional photographers were threatened with legal action for photogaphing it. The new/current owners (a consortium that includes actor Clint Eastwood) don't appear to be interested in trying to control images of the tree. In any event I think that their legal "leg to stand on" was not copyright, but rather derived from the fact that everywhere the tree can be easily photographed from is private property, and privacy restrictions can apply. Not 100% sure of any of this, so please don't quote me. So if I take a shot of the Golden Gate Bridge from the Marin Headlands, am I infringing on copyright? This is not a natural object, and surely many photographers have taken the same shot with the same intentions and displayed their work publicly. "So if I take a shot of the Golden Gate Bridge from the Marin Headlands, am I infringing on copyright?" No, for that you get arrested by Homeland Security. Just because you have copyright to a photograph doesn't mean you have the right to display it publicly or to reproduce it for sale. If the object photographed is identifiable and privately owned, such as a tree in your yard, your child, your own face, or a building you designed or own, the photographer's rights are limited without your release. Copyright is still owned, but the commercial value of it is diminished. (a) I'm not familiar with that tree at Pebble Beach, but you can't protect an object or a vista -- esp. a natural one -- via copyright. Mike is correct: If they were restricting photos from that location, it was almost certainly based on their right to control access to private property. (b) W/r/t to the Golden gate bridge: While architects' drawings or plans are protected by copyright (at least those created after 1990), they do not have any right to control images of the buildings or bridges made from those plans. So photos of the bridge or any other building do not infringe any copyright. (c) "If the object photographed is identifiable and privately owned, such as a tree in your yard, your child, your own face, or a building you designed or own, the photographer's rights are limited without your release." Yes and no. A number of states have "right of publicity" laws that give you the right to control the commercial use of your name or image. But these laws do not apply to buildings or objects. I've heard that there is a difference in copyright ownership if you do a job for someone, depending on whether you are properly employed by them, or freelancing/contract work for them. In one case the artist owns the copyright, in the other the employer owns it. Does anyone know anything more baout htis? As a general matter, the creator, or author, owns the copyright in any work he or she creates from the moment of creation. However, if a person creates a work within the scope of their employment (e.g., a staff photographer for a magazine) or pursuant to a contract, the employer owns the copyright. That's known as a "work for hire." Mike then said: "No, for that you get arrested by Homeland Security." There has never been a case of tying to stop anyone from photographing the GGB. If need be one can buy the complete plans to the bridge in the gift shop. Of course it should be pointed that this is an US-centric article. Copyright law differs from country to country, although the basic principles are the same. For instance, Canadian copyright law specifies that, in the abscense of an agrement, the owner of the copyright is the owner of the film, not the photographer (no, it has not been updated yet to take into account the proliferation of digital photography). Furthermore, some believe that the rights of the public have been eroted in favor of the rights of the creators. The extension of copyright in the US from 50 to 70 yers is the best example: it is not clear how an extension from 50 to 70 years benefits the public. Many argue that this benefits only the creators. Yes, copyright was intended to benefit the public at large, but the balance has now beel tilted (unfairly, in my opinion) to the creators. Another issue that is not mentioned in the article by Carolyn is the existence of copyrighted works in a photograph. Perhaps the most prominent problem with this is the French copyright law that guarantees copyright of buildings (or renovations to the buildings). Perhaps the best example is the Eiffel Tower's light display at night, which is copyrighted. One needs a license to sell or display photographs that include the Eiffel towars lit at night. However there have been several cases of Railfan photographers be rousted or arrested for taking pictures of trains from public property. A friend was recently taking train pictures from a bridge sidewalk with a 300mm lens and turned around to several police officers with their hands on their guns. "it is not clear how an extension from 50 to 70 years benefits the public. Many argue that this benefits only the creators. Yes, copyright was intended to benefit the public at large, but the balance has now beel tilted (unfairly, in my opinion) to the creators." Not necessarily the CREATORS, per se, but the copyright OWNERS. Walt Disney is deceased, for example, but that didn't prevent Congress from toadying up to Disney's current owners. This is part of a larger argument about what now constitutes government's "public," but I'm pretty sure we'd better not get into that. There is a famous case in Canada that went to the Supreme Court. In the province of Quebec, you need to be much more careful. You cannot simply take photos of people in public places and publish them. While you might enjoy the copyright, you don't enjoy the right to necessarily publish. Regarding street photography in Canada. One thing that makes the "Aubry v. Editions Vice-Versa" decision tricky (right to privacy vs freedom of expression) is that it is based on Quebec law, which is different from the rest of the provinces. No other ruling (to my knowledge) has been done in a similar case in other provinces. One must also remember that there is a difference between the right to take a photo, and the right to make copies of the photo (beyond personal use). The act of taking the photo is not restricted by copyright law. It is, instead, restricted (in some cases) by criminal law.